Belmont’s 2015 Gabhart Award for Staff Excellence and Service was presented to Telecommunications Service Manager Gary Hunter during the university’s annual staff breakfast on Tuesday, Dec. 8. 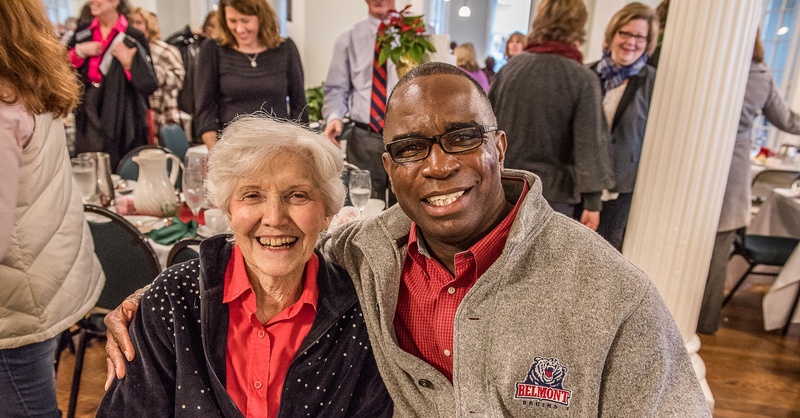 Named in honor of Dr. Herbert C. Gabhart who served Belmont selflessly for 50 years, the Gabhart Award is the highest honor presented to a staff person and honors a member of the Belmont community who demonstrates significant achievements, commitment and service to the University. In his position as telecommunications manager, Hunter manages Belmont’s telephone, voicemail and cable television systems, campus-wide. In addition to his job duties, Hunter serves as an advisor for Belmont’s Black Student Association and facilitates “Real Talks,” frequent dialogue sessions where members of the Belmont community are encouraged to share their thoughts and feelings regarding diversity on campus. For Hunter, winning the Gabhart Award of Service signified the recognition of his hard work and commitment throughout the 20 years he has called Belmont home. Most importantly, it honors Hunter’s likeness to the late Dr. Gabhart, Belmont’s longtime president and chancellor who Hunter personally knew and respected. “Winning the Gabhart Award of Service means so much to me. It exemplifies the service and the care that Dr. Gabhart gave to students, staff and faculty. I could not be more honored to be mentioned let alone receive an award based on the examples of such a great man,” Hunter said. 2015 Gabhart award finalists include Greg Pillon, director of communications, Erin Ritter, Honors office manager and Candace Smith, School of Nursing program assistant.